After confirming his entry Tony went on to say, "To be clear: I never said I was retired; the media did. I've been wanting to skate the Pro-tec event for a while, but I was either out of town or hurt over the last few years. To me, the Pool Party event symbolizes how far skating has come, where legends and modern skaters ride together in an iconic pool. Just hoping I can still do my Upland lines..."
Elsewhere, it seems that Tony Hawk has become the oldest skater to land a 900. According to Grind.TV, Tony Hawk landed the trick during a demo tour in Sweden, just days after his birthday,.He soon tweeted about the accomplishment and during an interview on Wednesday. He explained that it just felt right at the time. "It's still hard for me; it's still a big deal for me to do it," he said. "I don't really plan it, it usually just happens in the moment -- if I feel like the ramp is good and the crowd is behind me, then maybe I'll start trying them. Tony Hawk was the first skateboarder to stick a 900 during a competition -- a trick so difficult that it required 11 attempts during the 1999 X Games, for an athlete who had seen the trick play out in his mind for 10 years. That remains one of the top moments in X Games history. 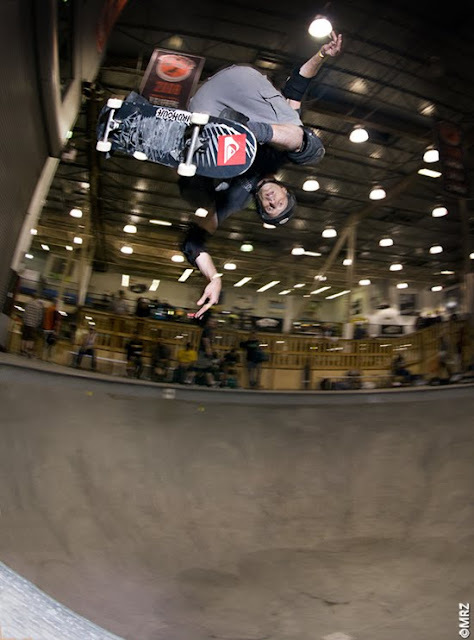 More recently, however, Hawk made headlines in the action sports universe after becoming, at 43, the oldest skateboarder to nail the 900, which involves 2 1/2 rotations above the vert ramp and is difficult even for today's top young pros. Watch Tony and all the Pro-Tec Pool Party shredders on the live webcast! Action begins at 3pm Saturday, May 21st. And be sure to enjoy Chris Nieratko's play by play, color-commentary on Vans' Twitter feed. Believe me, Pro-Tec will be awesome to watch tomorrow. News broken by Vans Website (well - of course) but in matter of hours, the news went viral with all major skate websites reporting the news including Thrasher, ESPN, Concrete Disciples, an Birdhouse.